Hibernating Bear by Mary Engel is her latest incredible sculpture made with thousands of bullets. 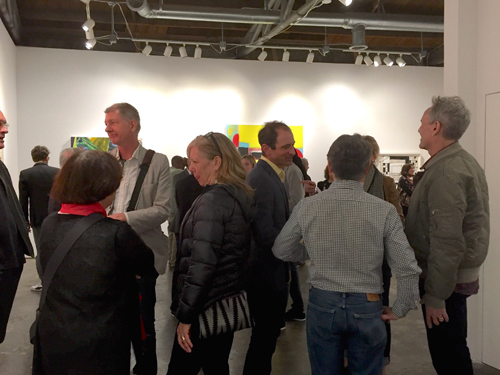 It was included in the critically acclaimed exhibition Unloaded presented by Dashboard U.S. through May 20. 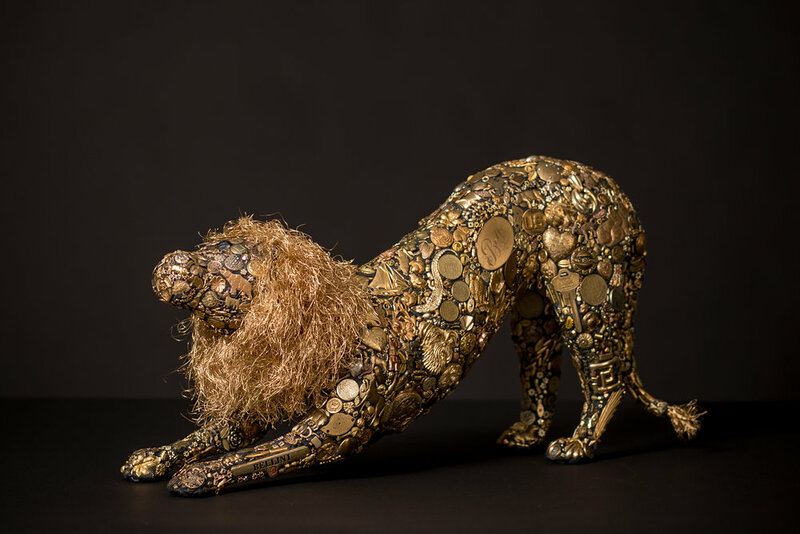 Mary Engel has exhibited her found object assemblage sculpture of animal figures at Marcia Wood Gallery for over twenty years. Mary is passionate about animals and has created many beautiful works to honor them. Her main subject was primarily dogs, with a few cats, horses, rabbits and elephants in the mix. In the last few years her menagerie has expanded to include polar bears, bison, a tiger, and even an alligator. From the beginning of her practice, Engel's foundation of inquiry has been an exploration of the development of culture through myth and fable, and as with so much of the lore she studies, she has designated the archetypical animal form as representatives of humanity. My lifelong love for animals and the connection I feel with them inspires me to sculpt. The depth of love given to and received from dogs since I was a little girl is immeasurable. My current pack, Gabrielle and Tinkerbelle makes me walk, play and laugh every day. I build using wire mesh and hydrocal then cover with epoxy and ammo. Each piece is built from the paws or hooves up, is hollow and unique. Through my work, I aspire to create whimsical animated creatures using gesture and ‘movement’ to capture a presence I feel animals possess. The bullet sculptures are an attempt to reveal the animal’s beauty and grace as well as the atrocities perpetrated against them. Paradoxically, the surface created with thousands of bullets on each figure cloaks the animal in a golden glowing skin that brings to mind mythological beings or armored warriors. Mary's work also greets visitors at Hartsfield Jackson International Airport International Terminal E.
Originally from Chicago Engel moved to Athens, GA in 1993. Her work has shown and been reviewed nationally since 1986 in galleries, art fairs and museums. Engel's work is held in private collections as well as institutions including Children’s Healthcare of Scottish Rite in Atlanta, The Arthur Blank Family Foundation, the Detroit Zoo, the Disney Corporation the President’s Collection of the University of Georgia and the United States Embassy, Rome, Italy. Museum exhibitions include Macon Museum of Arts & Sciences, Macon, GA, Museum of Contemporary Art, Atlanta, GA, Huntsville Museum of Art, Huntsville, AL, Asheville Museum of Art, Asheville, NC, and Fine Arts Museum of the South, Mobile, AL. conjunction with her solo show at the gallery in the coming 2018 season. As the National Rifle Association hosts its 146th annual meeting in Atlanta (April 27-30), Dashboard US welcomes UNLOADED, a multimedia group show that explores historical and social issues surrounding the availability, use, and impact of guns in our culture. Artists include: Lauren F. Adams, Natalie Baxter, Nina Berman, Joshua Bienko, Casey Li Brander, Anthony Cervino, Mel Chin, Cathy Colman, Dadpranks, James Duesing, Jessica Fenlon, Vanessa German, Jinshan, Andrew Ellis Johnson, Laura Karetzky, Jennifer Meridian, Adrian Piper, Don Porcella, Devan Shimoyama, Susanne Slavick, Renee Stout and Stephanie Syjuco. Local artists commissioned and curated by Dashboard include: Paul Stephen Benjamin, Branden English, Nancy Floyd, Jason Kofke, Joe Peragine, Carl Janes, Mary Engel, Lonnie Holley, and Jim White. Cosmo Whyte was born in St. Andrew, Jamaica in 1982. The Jamaican born artist attended Bennington College in Vermont for his Bachelor in Fine Arts, Maryland Institute College of Art for his Post-Baccalaureate Certificate and the University of Michigan for his MFA. He has exhibited in the US, Jamaica, Norway, France and South Africa. In 2010 he was the winner of the Forward Arts Foundation Emerging Artist of the year award. In 2015 he was the recipient of the International Sculpture Center’s “Outstanding Student Achievement in Contemporary Sculpture Award” and in 2016 he was the recipient of an Artadia Award. In 2016 Cosmo Whyte participated in the Atlanta Biennial and the recent 2017 Jamaica Biennial. He is a finalist for the 2017 Hudgens Prize, and has been nominated to represent Jamaica at the 2017 Beijiing Biennial. Cosmo Whyte is based in Atlanta, Georgia and Montego Bay, Jamaica and is currently a professor at Morehouse College. Look for Whyte's first solo gallery exhibition at Marcia Wood Gallery in October 2017. Frances Barth's new animation, Jonnie in the Lake, won Best Animated Short at the 2016 New York Short Film Festival. Jonnie also premiered in Canada at the Sunrise Film Festival in Nova Scotia and was nominated for Best Short Film. Barth released her new Graphic Novel Ginger Smith and Billy Gee: An Optimistic and Utopian Tale. Millions of travelers have been taking selfies with Mary Engel's wonderful sculptures installed at the E International Concourse of Atlanta's Hartsfield Jackson airport. Here are the next going on view!